Last Tuesday, I started running again! It felt so good to wear my running shoes and run ’till I sweat, pant, and can’t talk no more. 🙂 Next to meeting God, running a few kilometers in a garden in the middle of the Makati Central Business District (CBD) is one of the few reasons I look forward to waking up in the early morn. 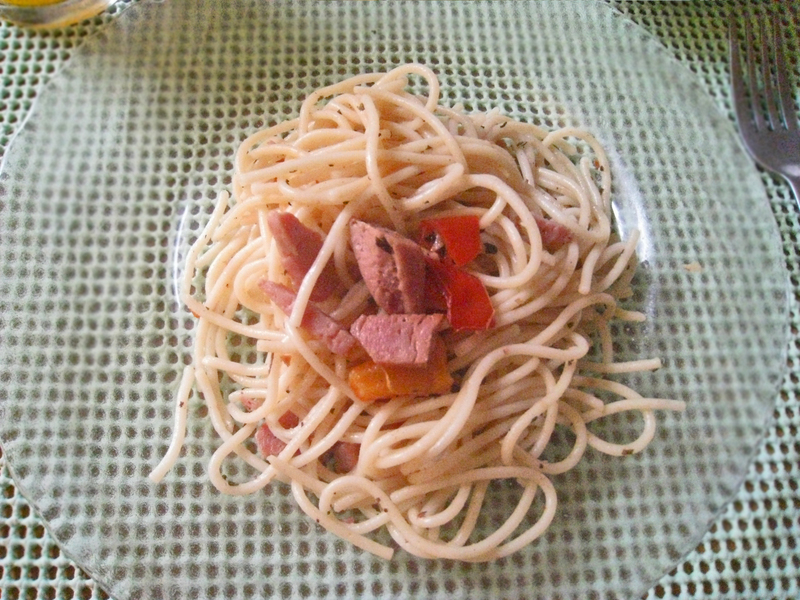 Then last Thursday, I cooked a healthy, low-cost pasta dish! Now that I have all the time in the world I can run and continue enhancing my cooking skills. This dish I adapted from Women’s Health Whole-Wheat Spaghetti With Sweet Peppers and Chicken Sausage recipe. As usual, I lacked the exact ingredients stated in the recipe so I tweaked the dish using ingredients available at home. Thankfully, my Dad brought home a few cans of Spam so I used that instead of chicken sausage. It turned out swell! Everyone at home enjoyed the dish. Heat 2 tablespoons oil in a skillet over medium-high heat. Add Spam and brown lightly on both sides, about 7 minutes. Transfer cooked sausage to a plate and cover loosely with foil. Wipe out the pan. Add remaining oil to the skillet. Saute garlic over medium-high heat until fragrant, about 30 seconds. Add peppers and saute until shiny, about 1 minute. Cover the pan and reduce heat to medium-low. Cook until peppers are soft but not mushy, about 10 to 15 minutes. Season with salt and pepper. Add Spam and basil to pan, and mix gently. Cook pasta until al dente, according to package directions. Drain in a colander, leaving a little water in the pot. Pour the pasta back into the pot and toss to prevent sticking, then add it to the pan with the sauce and combine. Divide among plates, garnish with fresh basil, and serve. I know it’s not the most appealing photo of a supposedly delicious pasta (but really, it’s good), but I don’t exactly have a very good camera (or photography skills). My Dad wasn’t home when I cooked this so I had no one to take good photos with an excellent camera. At least I tried! By the way, if you’re a runner and you’re searching for a playlist that could help fire up your albeit monotonous run, then I suggest you update your playlist with these songs emailed to me by Chris Lawhorn of Run Hundred.